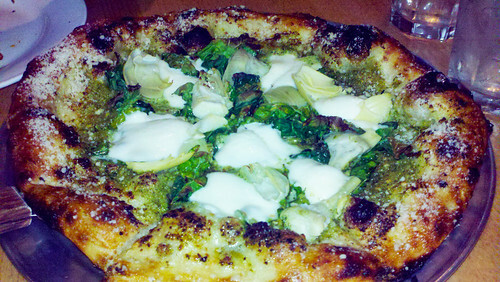 A relative newcomer on the Columbus Food Scene , Harvest Pizzeria has made a big impression on pizza lovers all over the city. Nestled in German Village (just south of Livingston Ave.) and with the bonus of its own parking lot, Harvest serves some of my favorite pizzas anywhere. The secret is Harvest&apos;s crust. Made with a meticulously developed recipe that left dozens of dough-styles behind, this crust is at once crisp and chewy. It&apos;s thin, yet holds up to any toppings. I would be happy to eat this pizza crust with no toppings at all. It&apos;s also baked in a high-temperature wood-fired oven, which lends the crispness without imparting too much of a smoky flavor. My favorite pizzas so far have been the Spicy Yuma (I sub mushrooms for the chorizo) and the Pesto with kale, almonds and fresh mozzarella. The setting is casual and rustic with a communal dining feel. This isn&apos;t a large restaurant, and it can get pretty busy at peak hours. In warmer weather, the patio adds space and some German Village charm, too. 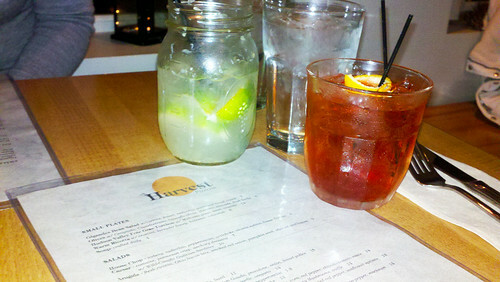 Drinks are served in Mason jars, and despite the high caliber of the food, nothing would classify as fussy. The drinks are not to be missed, either. 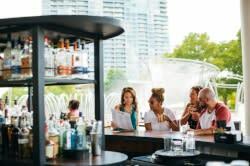 With a strong focus on local spirits and beer, and a globe-trotting wine list, you&apos;ll find something to pair with whichever pie you choose. My personal favorite is the Negroni, made with Columbus&apos; own Watershed Gin and a healthy splash of campari. The Moscow Mule (made with local OYO Vodka ) is also a stand-out - gingery, slightly sweet, complex and a great as a pre-dinner drink. I&apos;d also be remiss not to mention that you can also order a big bottle of Rockmill Brewery &apos;s Saison - a beer that stands up to the best old-school Belgian brews.